PRODUCT INFORMATION GLASSFLOOR SWISSNESS Custom-made walkable skylight-871.html">skylight Thermally insulated stainless-steel frame profile with an elegant stainless-steel border (0.3 cm). Load-bearing glazing, can be walked or driven on, depending on the design, both in private and in public installations. 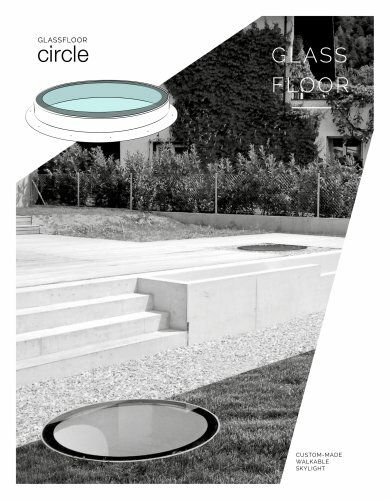 Structure Glassfloor circle, insulated 1 Cover glass 2 Static LSG1 3 Inner LSG1 4 Chrome steel frame 5 Insulated chrome steel profile 6 Support for glass 7 Grouting 1 Laminated safety glass, extra white, glazing in frame profile with all-round sealing ex works.